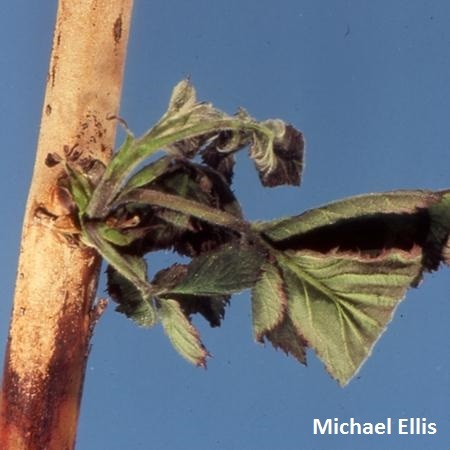 Raspberry cane blight is caused by the fungus Leptosphaeria coniothyrium (also called Kalmusia coniothyrium). All species of Rubus are susceptible to cane blight, but in New England it is more often a problem in raspberries, especially black raspberries. Several other woody perennials are also susceptible. 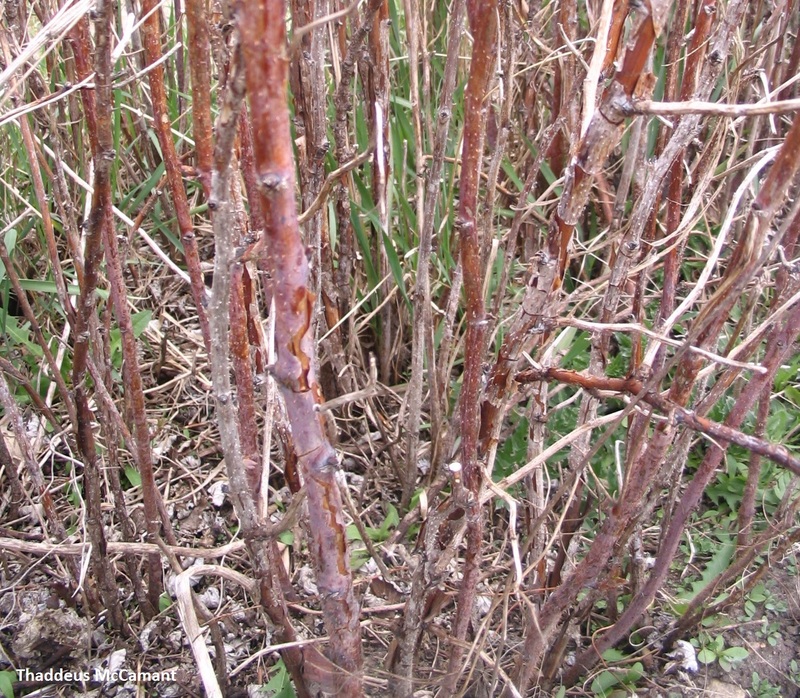 Cane blight infects first year canes through wounds and grows into the vascular system. The fungus overwinters in infected canes and on pruned cane stubs. In the spring, spores (both ascospores and conidia) are released from mature fruiting bodies in wet weather and dispersed by splashing rain or irrigation. Spores germinate in wounds and produce new infections. Pruning wounds are the most common site of infection, but all types of wounds are susceptible. Visible symptoms may not occur in the same growing season, but if the outer cane tissue around a wound is peeled back, vascular discoloration may be observed. Lesions are dark red with an irregular purple border, and the centers may turn gray. In the second year wilting, bud failure, and dieback of floricanes may occur. Cankers often girdle the canes. The tissue near the infection site can become brittle and break easily as the fungus degrades cellulose. Blighted canes may turn silver in color as masses of conidia dry on the cane surface. Sunken, black fruiting bodies resembling tiny peppercorns may be visible. Canker tissue is reddish beneath the cane epidermis, with vascular discoloration extending from it. Prevent wounding of canes as much as possible. This can be more challenging in mechanically harvested raspberries than hand-picked ones. Proper spacing and weed control maximizes sun exposure and air flow and facilitates drying of canes. Do not prune or work with canes in wet weather. Avoid overhead irrigation, which soaks foliage and contributed to splash dispersal of spores. Sanitation is crucial, as the fungus overwinters in infected plant material. Remove spent floricanes after harvest and burn or bury them. Prune old canes to the ground. “Tipping” or “pinching”: Removing the top 1-4” of primocanes when they reach their optimum height (3-4 feet) is believed to cause less damage than other pruning methods. The optimum time for this practice is when dry weather is expected for at least three days. Control insect pests such as borers and cane maggots, as their feeding can cause small wounds through which the fungus can infect plants. Plant resistant or tolerant cultivars when available. The blackberry ‘Chester’ is resistant to cane blight. The raspberries ‘Julia’, ‘Nova’, and ‘Newburgh’ are considered tolerant. Stressed plants are more susceptible to diseases. Proper fertilization and irrigation will help prevent plant stress. An early spring application of lime sulfur can decrease disease incidence. Apply before buds are ½ inch long.